A birth defect (also known as a congenital defect or anomaly) is a physiological or structural abnormality in an infant that is present at the infant’s birth. Birth defects can be caused by many things, including hereditary factors, environmental influences, or medications taken by women during pregnancy. According to the Centers for Disease Control and Prevention (CDC), most birth defects are thought to be caused by a complex mix of factors. While defects in an embryo’s or fetus’s formation can occur during any stage of pregnancy, most occur in the first 3 months, when a baby’s organs are forming. Because tissues and organs continue to grow and develop during the last 6 months of pregnancy, however, birth defects can occur during the later stages, as well. Many birth defects cannot be prevented. But, the risks of some types of birth defects can be significantly reduced through maternal behavior and adequate obstetric care. Folic acid supplementation, avoidance of alcohol, cessation of smoking, control of diabetes, and avoidance of certain medications are among the important steps that can be taken to lower the risks of certain birth defects. When an obstetrician fails to provide a pregnant woman and her unborn child with adequate care and treatment, the obstetrician may be held liable for birth defects determined to have been caused by the obstetrician’s negligent care. Certain medications taken during pregnancy may also cause birth defects. These drugs are known as teratogens and are said to have teratogenic effects. A drug manufacturer that fails to provide adequate warnings regarding a medication’s known or knowable teratogenic effects may be found liable for birth defects determined to have been caused by a woman’s use of the medication during pregnancy. The manufacturer may also be held liable for birth defects found to have been caused by the manufacturer’s marketing of a medication for use during pregnancy that has been shown to cause birth defects. Teratogenic substances in the environment may also cause birth defects in children of mothers who are exposed to these substances while pregnant. When a pregnant woman has been exposed to such a substance through someone’s negligence or other actionable conduct, the responsible individual or entity may be held liable for a child’s birth defect determined to have resulted from the mother’s exposure. Birth-injury and birth-defect attorney Jeffrey Killino has considerable expertise and experience with birth-injury and birth-defect cases and is dedicated to achieving justice for children who have sustained birth defects or injuries as a result of medical negligence, environmental toxins, or drugs that are unreasonably dangerous for use during pregnancy. If your child has sustained a birth defect due to one or more of these causes, you may be entitled to compensation through legal action. Contact birth-injury and birth-defect lawyer Jeffrey Killino at 877-412-8490 for a free evaluation of your case and additional information about your legal rights and options. Many birth defects that might have been prevented are caused by negligent medical care or by the use of certain drugs or exposure to environmental teratogens during pregnancy. The following are a few of the many examples of birth defects that may be caused in these ways. Congenital heart defects are abnormalities in the structure or operation of a baby’s heart that are present at birth, and are the most common type of birth defect, according to the CDC. This type of birth defect may be caused by the use of certain medications or drugs during pregnancy, as well as smoking during pregnancy and other health conditions in the mother. The acne medication Retin-A and the anti-nausea drug Zofran, for example, have been linked to congenital heart defects in babies of mothers who used these drugs while pregnant. The off-label marketing of Zofran by the manufacturer for use during pregnancy may lead to the manufacturer’s liability for congenital heart defects determined to have been caused by pregnant women’s off-label use of the drug for morning sickness, while a physician’s negligent prescription of Retin-A to a pregnant woman may result in the physician’s liability for the same defect. Congenital heart defects have also been linked to pregnant women’s exposure to environmental toxins. The American Heart Association (AHA) has reported, for example, that in Alberta, Canada, yearly rates of congenital heart defects correlate to yearly emissions of some industrial pollutants. The mix of chemicals shown to exhibit a h2 correlation to congenital heart defects included benzene, butadiene, carbon disulphide, chloroform, ethylene oxide, hexachlorobenzene, tetrachloroethane, methanol, sulphur dioxide, toluene, lead, mercury, and cadmium. Manufacturers of these substances as well as individuals or entities that negligently expose pregnant women to these substances may be held liable for congenital heart defects determined to have been caused by women’s exposure to the substances during pregnancy. Cleft defects are among the most common types of birth defects in babies born in the United States. Cleft lips and cleft palates are defects that occur when babies’ lips or mouths do not form properly during early pregnancy. A baby’s faces develops as body tissue and cells from both sides of the head grow toward the center of the head and join together, forming facial features, including lips and mouth. The lips form between the fourth and seventh weeks of pregnancy and the palate, or roof of the mouth, during the sixth and ninth weeks. Cleft lips and cleft palates occur when lip or mouth-roof tissues do not sufficiently join together before a baby’s birth. Some babies are born with one or the other defect and others are born with both. Certain drugs, if taken by a woman during the early stages of her pregnancy, have been found to cause cleft defects. Topamax (topiramate), for example, a drug approved by the U.S. Food and Drug Administration (FDA) as an anti-seizure and migraine-headache medication, was reported by the FDA in 2011 to pose a twenty-fold increase in the risk of cleft defects in babies of mothers who took the drug during pregnancy. A physician who prescribes a medication to a pregnant woman that the physician knows or reasonably should have known to be a teratogen may be found liable in a medical-malpractice action for a baby’s cleft birth defect determined to have been caused by the mothers’ use of the teratogenic medication during pregnancy. Thus, a physician may be found liable for cleft birth defects caused by the physician’s negligent prescription of Topamax or another known teratogen during a woman’s pregnancy. In some cases, cleft defects have been caused not by physician negligence but by drug manufacturers’ illegal off-label marketing of teratogenic drugs to physicians for use by their pregnant patients. GlaxoSmithKline (GSK), for example, has marketed the use of Zofran to physicians to relieve their pregnant patients’ morning sickness despite the absence of FDA approval for this use of the drug. Zofran, which is known to double the risk of certain birth defects, including cleft abnormalities, has been approved by the FDA only to relieve nausea and vomiting caused by surgery, chemotherapy, or radiation therapy and not to relieve morning sickness caused by pregnancy. This “off-label marketing” of Zofran by GSK may be found to have rendered the product defective under products-liability law and may result in the strict liability of GSK for cleft and other birth defects determined to have been caused by Zofran’s off-label use. Pesticides have also been found to cause cleft defects. Manufacturers of these substances may be held liable for cleft defects determined to have been caused by pregnant women’s exposure to the pesticides. In addition, individuals and entities that negligently expose pregnant women to these substances may also be held liable for cleft birth defects determined to have been caused by pregnant women’s exposure. Spina bifida is a type of neural-tube birth defect (NTD) that results from the failure of a neural tube to fully close at any point along the spine. The opening leaves the spinal cord inadequately protected and may lead to spinal-cord and nerve damage. Spina bifida may occur due to use of any of a number of teratogenic drugs during pregnancy, folic-acid deficiency, and other causes. Spina bifida and other NTDs have been linked to the use of certain medications during pregnancy, including anti-depressants Paxil, Zoloft, Wellbutrin, and Lexapro and anti-seizure medications such as Depakote, Topamax, and Valproate. When a physician negligently prescribes such a medication to a pregnant patient, the physician may be held liable for a baby’s spina bifida birth defect determined to have been caused by the mother’s use of the medication during her pregnancy. In addition, if a drug manufacturer fails to provide sufficient warnings regarding a drug’s spina bifida or other teratogenic effects that were known or knowable by the manufacturer, the manufacturer may be held liable for a baby’s spina bifida birth defect found to have been caused by this failure to warn. NTDs have also been linked to pregnant women’s exposure to pesticides. In one study, analysis of placental concentrations of polycyclic aromatic hydrocarbons (PAHs), organochlorine pesticides, polychlorinated biphenyls, and polybrominated diphenyl ethers in 80 fetuses or newborns with NTDs showed a dose-response relationship between PAH levels and risk of NTDs. In another study, women who were exposed to agricultural pesticides during pregnancy were shown to be at increased risk of giving birth to children with anencephaly, an NTD leaving newborns with only partial brains and skulls that is usually fatal. Pesticide manufacturers and individuals or entities that negligently expose women to these pesticides may be held liable for NTDs determined to have been caused by pregnant women’s exposure to the pesticides. Many birth defects are caused by preventable medical error, the use of teratogenic medications, or exposure to environmental toxins during pregnancy. 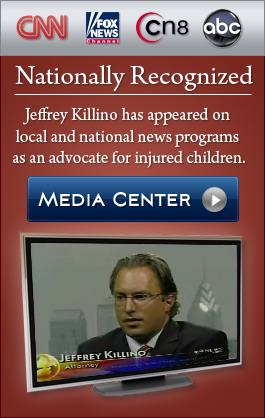 Birth-injury and birth-defect attorney Jeffrey Killino is known nationwide for his tenacity in fighting for the rights of children who have been injured in these and other ways. If your child has sustained a birth defect due to any of these causes, attorney Killino can help you obtain justice from those responsible for your child’s suffering. Contact attorney Killino at 877-412-8490 for compassionate yet aggressive representation.